Myrtle Beach and the Grand Strand is a great place to live or to visit any time of the year, but especially in the fall. The fall is actually the most popular time to visit the Grand Strand. Visitors, as well as full-time and part-time residents, love the area’s 60 miles of tranquil beaches, the excellent fishing, and perfect weather for golf in the fall. Anything that that can be done in the summer can still be done in September. It’s a great time to visit Myrtle Beach – cooler and cheaper! And it’s even a better time to find a home and live in Myrtle Beach. Here are a few things that The Trembley Group Real Estate Sales Executives are looking forward to in September. 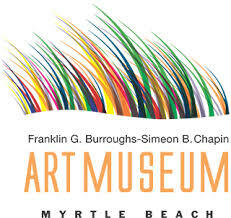 Art-lovers in Myrtle Beach shouldn’t miss the Franklin G. Burroughs-Simeon B. Chapin Art Museum. This free attraction hosts a variety of changing exhibits throughout the year. This fall, guests can view the works of Celia Pearson, and Logan Woodle, as well as the 39th Annual South Carolina Watermedia Society Juried Exhibition. The museum also has entertaining programs for youth and adults to learn more about art. Feast Your Eyes will explore our culinary heritage as nourishment and beyond: a form of cultural, political and artistic expression; an enduring source of comfort; sometimes an object of obsession; perhaps a symbol of class, race or gender…and always a cause for celebration. Food and beverage icons, peculiar and particular to the South, will be examined with works in an expansive variety of two and three-dimensional media, including paintings in oil and watercolor; works in pastel; printmaking; photography; sculptures in ceramics, metal, wood and mixed media; textile and fiber arts, and functional art such as handcrafted dining furniture and serving ware. These objects will invite viewers to explore the confluence of the three distinct foodways (Native American, African and European) which have converged over time and place to form our unique cuisine, originally one of survival, now exalted for its honesty, comfort, and generosity. Feast Your Eyes will bring together painters and sculptors of startling realism; artists working larger than life and those working much smaller; some who are exploring the politics, psychology, and humor in the food of the South; others who work with unexpected materials, and those who seek to help us “gather at the table” in an artful way. You’re sure to enjoy every course of this mouth-watering, provocative and evocative exhibition. Join Karen Olson, one of the exhibition curators, for an afternoon tour of our mouth-watering summer exhibition, Feast Your Eyes | Celebrating the Food of the South on Saturday, September 9, 2017 from 2-3 pm. No charge, no reservation necessary. 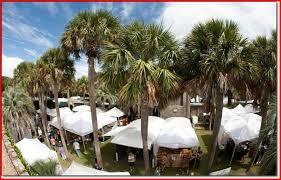 Featuring more than 100 of the finest local and regional artisans, the Atalaya Arts & Crafts Festival provides a wonderful backdrop of natural beauty for the festival. Art-lovers can enjoy fine art, quality crafts, and food, along with the musical offerings of several of the area’s finest musicians. Friday, Sept. 22, Noon – 6 p.m.
Saturday, Sept. 23, 10 a.m. – 6 p.m.
Sunday, Sept. 24, 10 a.m. – 5 p.m.
Daily festival admission fee is $10 for adults. Once admission is purchased, admittance is free throughout the weekends with the festival ticket. Park Admission during the festival is also free. The Horry Georgetown Home Builders Association’s 6th Annual Fall Show returns to the Myrtle Beach Convention Center Friday, September 22 through Sunday, September 24. The Home Improvement & Outdoor Living Show is a source for any home’s needs – inside and out. The Fall Show is the best place for talking with the best and brightest in the Myrtle Beach building industry. Whether wanting to build a new home or remodel an existing one, the Horry Georgetown Fall Show is a place to find builders and remodelers with years of experience and knowledge to make a dream home a reality. There will also be specialty contractors in attendance with information on new roofs, HVAC systems, countertops, or windows and doors. For those interested in turning their yard into an outdoor living space, there will be landscape designers, landscapers, pools, spas, sunrooms, outdoor kitchens and much more. The 2017 Home Improvement and Outdoor Living Show has something for everyone. Admission is $5 for adults and children under 16 are free. Three-day passes are available for $10. 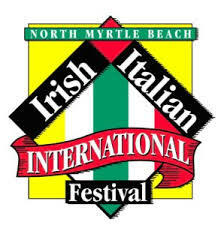 The City of North Myrtle Beach will host the 14th Annual Irish Italian International Festival on Saturday, September 30, 2017. This one day rain or shine event brings approximately 15,000 to celebrate different cultures. The festival begins at 10:00 a.m. and continues until 4:00 p.m. on Main Street in North Myrtle Beach. The festival features food from local restaurants, two stages of live entertainment, street performers, art & craft vendors, and dance groups all surrounding an Irish/ Italian International theme. Restaurants will compete for the title of Best Entrée, Best Decorated, and Best Dessert. Festival goers can also join in a friendly spaghetti eating competition! Enter Claudio’s Spaghetti Eating Contest, sponsored by Villa Romana, at this year’s Irish Italian International Festival. First to clear their plate (without using their hands) wins bragging rights and a stylish plaque designed by Coastal Engravers. Individuals may sign up at the Info Booth or the CIAO booth between 10 a.m. and 1:45 p.m. at the festival. No entry fee. Once registered, participants should arrive at the Hillside Drive Stage by 2 p.m. Contest begins at about 2:15 p.m. at the Hillside Drive Stage (400 Main Street – in front of Hope Taylor & Co.). 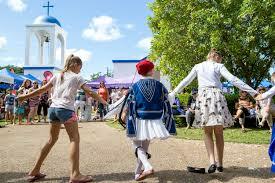 For a little more international flavor, the annual St. John’s Greek Festival, a celebration of Greek culture, cuisine and family fun is also in September. It’s one of the most loved Myrtle Beach festivals of the fall. This year’s 25th annual event will take place Thursday, Sept. 28 through Sunday, Oct. 1, 2017. The festival offers spanikopita, gyros, baklava, cookies, salads, pastries, breads and more. St. John the Baptist Greek Orthodox Church hosts this tasty annual event. The event is fun for the whole family and offers inflatables, live performances and music, craft and vendor tables and tours of the beautiful church. There’s just something so inviting about this annual festival. It’s hard to resist the hundreds of pastries. And the traditional lamb or chicken gyros on fresh pita with tzatziki sauce, spices, lettuce, tomatoes and onions are perhaps the most commonly ordered meal and are hard to beat. It’s worth trying the mousaka or pastichio for a taste of the Greek life. Mousaka is an eggplant casserole with layers of ground beef, cheese, potatoes and a cream sauce. Pastichio is an interesting classic dish with ground beef, cinnamon, nutmeg and a cream sauce inside of baked macaroni. And don’t miss the roasted Greek potatoes and Greek salad to accompany it! Still hungry but not ready for dessert? Move on to the spanikopita or tiropita. Both made with cream cheese, egg and filo pastry. These delicious sides are filling as well as tasty. Spanikopita has a spinach filling so technically speaking, it’s eating your vegetables! The Dolmathes or stuffed grape leaves are hand-rolled perfection.